I have been tardy in replying to two memes. The first is from Camille from her NOW blog about 13 facts from my childhood. The second meme is from Theresa from her Sleeping Kitten Dancing Dog about blogs that make me think. As this is the second time for this meme I will modify this to some of the blog drive-byes that I enjoy. Ed from his The Pisstakers blog always has a humorous slant on the goings on in the blogosphere and believes in community and link sharing as does RT from Untwisted Vortex. For discussions on different aspects of life I stop by Jennifer at Goodness Gracious and Pearl at Interesting Observations. 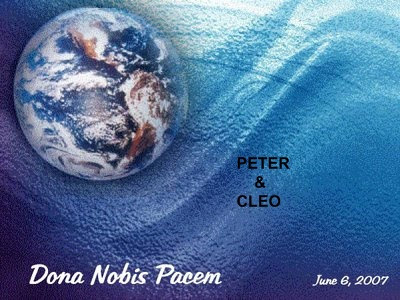 Don't forget than June 6, 2007 is the day to display your Peace Globe. If you don't have one you can get it from Mimi at her Mimi Writes. Cleo and I have ours to display on the 6th. What a new insight with your first meme. I didn't realize you weren't always in Canada. Good information. So, you hated girls huh? Thanks for the drive-by. I have lost my backlinks somehow. If you try to open a post for that particular item all you get is a blank page. The address shows, just no post to go with it. Working on it, but yikes, it's been difficult. See you tomorrow. Forts eh? I used to love having forts! And gymnastics! That's great Peter. Thanks for the mention, Peter and I enjoyed reading this childhood meme. This is one that I am going to challenge myself to do, soon. I wanted to thank you for the very perceptive and understanding comments that you leave on my blog. You are a special person. lovely meme peter. and i see you are ready for the globes tomorrow! with that lovely kitty of yours too. 27? Hehehe, yeah right! And I'm only 16! You know, I don't remember that much from my own childhood. Perhaps if I sat down to ponder it for some time, some of the memories would come back. I think, though, too many years of doing too many things as an adult has pushed some of the memories into places I'll never be able to pull them out from.